Director Jeffrey Lau turns the ’Jiang Shi’ vampire genre on its head, removing it from its usual backdrop of a Qing Dynasty village, and setting The Haunted Cop Shop in modern day Hong Kong, resulting in an all out horror laugh fest. 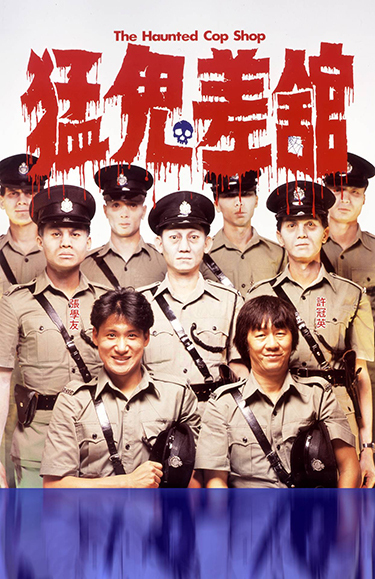 In a police station, which was once the site of a ritualistic suicide pact by Japanese soldiers after the war, police officers Chui (Ricky Hui) and Macky (Jacky Cheung) witness the resurrection of an evil Japanese Colonel. As they inform their peers about the resurrection, they are met with ridicule when nobody believes their farafetched story. As the Ghost Festival comes around, Ming (Billy Lau), a small-time thief detained in the basement of the police station, is bitten by the ghost, turning him into a vampire. When Chui and Macky discover Ming’s fate, the two attempt to prove the existence of creatures of the night to their fellow cops to regain their credibility.